More than 1 in 6 teenagers age from 6 to 19 are considered to be obese. Obesity is usually accompanied with various other diseases, which combined kill millions of people per year. These diseases include type 2 diabetes, heart disease, high blood pressure, nonalcoholic fatty liver disease, osteoarthritis, cancer, stroke and various others. The goal of this article is to provide a spatial overview of communities’ ability to access healthy food and quality diet, and to explore some environmental factors that are leading causes of overweight and obesity. I used R to pre-process the dataset into a more suitable structure for analysis. Then, Tableau is used to provide data visualization and analysis. Our data is acquired from United States Department of Agriculture (USDA). The dataset is the August 2015 version of USDA Food Environment Atlas that includes all states in the U.S. and their 200 attributes such as population, fast food store count, recreation & fitness facilities count, diabetes rate, obesity rate, National School Lunch Program participants rate, Household food insecurity rate, etc. These data are from a variety of sources and cover several years and geographic levels. In order to validate the dataset, we generated a simple scatterplot between diabetes rate and obesity rate for each state in the Figure 1 below. The reason we plotted such two variables was the well-established relationship between diabetic and obese. The strong positive correlation shown in the graph below gave us the confidence that the dataset agreed with our expectation. Again, we can see from Figure 1 that obesity clearly put Americans at higher risk of chronic diseases like diabetes. We are also interested in the adult obesity rate for different states in the United States, which is shown in figure 2. Red represents high obesity percentage whereas green vice versa. From this figure, we find that Mississippi (36.70%) has the highest rate of adult obesity in the country, placed ahead of Louisiana (35.55%), Alabama (35.08%), and South Carolina (34.65%). 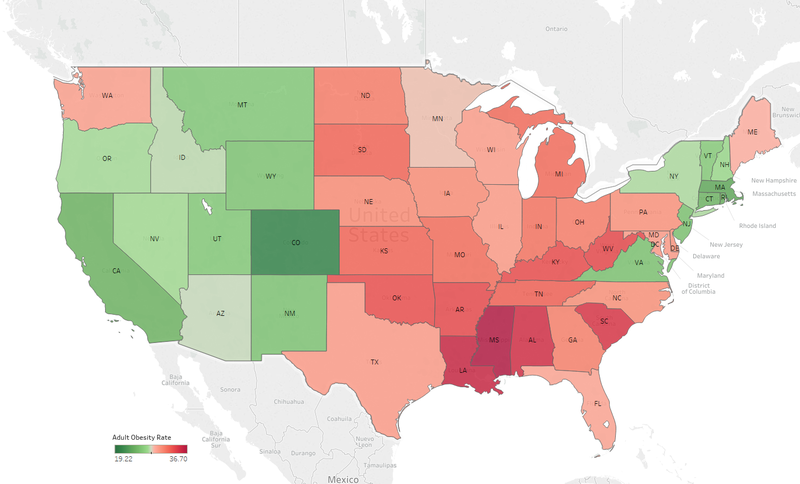 Hawaii (19.22%) has the lowest rate of obesity, with Colorado (20.68%), Massachusetts (23.39%), California (24.22%), and Connecticut (24.35%) being the four states with less than 25 percent of obesity. To summarize, the southeastern United States have the highest rates of obesity in the country compare to others. And below we will try to explore the possible factors that are causing the high obesity rates in these states. According to stateofobesity.org, African-Americans are nearly 1.5 times more likely to be obese compared with Whites and Latino adults. Approximately 47.8% of African Americans are obese while the rate for Whites is 32.6 %. Figure 3 below clearly shows that the southeastern states are the states with highest African-American population, which may be one of the reasons for the high obesity rate among these states. Another interesting factor related to obesity is the income level, since income level determines what kind of food one can acquire. Figure 4 above shows that low-income and poverty have a strong correlation with an increase in obesity rate. This could be explained by the fact that most affordable or less expensive food are either less nutritious or calorie-dense. Also, people in poverty may not have consistent access to healthy food since they have limited access to supermarkets and fresh produce. On the other hand, gas stations and convenience stores are their main food sources, but these stores mostly sell sodas, candy, and junk foods only. This phenomenon is what we call Food Insecurity. And with such less healthy eating pattern, it can be a contributing factor to weight gain and obesity. Figure 5 below proves that increase in Food Insecurity results in the increase of obesity rate with R-squared equal to 30%. It is also worth noticing that Mississippi, the highest obesity rate among the US, also has the highest food insecurity rate at 20.9%. Achieving healthy energy balance also requires being physically active regularly. And one reason for people not engaging in sufficient amount of physical activity is the lack of places for recreation and fitness facilities. Figure 6 below shows the count of recreation & fitness facilities for each state. Orange indicates the states with the lowest obesity rate across the United States, whereas blue indicate the states with the highest obesity rate across the United States. In the figure, we found that higher count of fitness facilities is more likely to support people with healthy lifestyle habits. In fact, it strongly influences the amount of physical activity. Four out of 5 states with higher numbers of fitness facilities are associated with the lowest obesity rate across the United States. In this article, we demonstrate the use of Tableau and R to run data visualization regarding to obesity in the United States. As a result, obesity is an actual and serious health problem in United States especially in southeastern states. The wide availability of junk food and its low price have maximized the chances of impulse purchases for families in poverty. Also, the lack of places to recreation discourage people to engage in physical activity. Therefore, the government may consider increasing their food security, enforcing state food policy on junk food, and increase affordable gyms that make people to be physically active in order to decrease the obesity rate. Flegal KM, Carroll MD, Kit BK, Ogden CL. Prevalence of obesity and trends in the distribution of body mass index among US adults, 1999–2010. Journal of the American Medical Association. 2012; 307(5):491–97. “Maximizing The Impact of Obesity-Prevention Efforts In Black Communities: Key Findings and Strategic Recommendations.” Special Report: Racial and Ethnic Disparities in Obesity. N.p., Sept. 2014. Web. I really like this topic, and obesity is really a increasing healthy problem nowadays in the United States, so this one actually helps people see what is going on. I think this is a very interesting choice of topic and really like the application of statistical analysis to a dietetics problem. However, given the first set of statistics outlined in the introduction, it appears as though another hypothesis test could be done to see if the true proportion of obesity is different than the 1 in 3 adults/1 in 6 children/1 in 20 extremely obese. Very interesting analysis. The variables you included clearly impact obesity rates. Considering the map of the US and the wide variation in obesity levels across states, I’d be curious to further explore what differences between the states drive the most difference in obesity levels. It might be interesting to include census data and all of the granular demographic information it includes to compare against obesity levels to further analyze this. Interesting analysis Ting. I find it strange that you called people of lower income getting fast food an impulse purchase. Often times this is the only food they can afford or have time to get between working day and night jobs, leaving them little time to prepare their own meal of higher quality. It would make sense for the government to make healthy food more affordable for these low income families so that their health can improve. Also in regards to the analysis of a lack of recreation areas in the southeastern US, I would argue that since it is humid subtropical climate it is much easier to get outside each and every day with relative comfort. That is compared to the midwest where there are days where it painful to go outside due to the weather. I found this analysis very interesting. Coordinating the accessibility of a fitness facility with obesity rates is interesting and intuitive. You mentioned that you did an analysis of 2015 data, it would be interesting to track this data as it has changed over time and seeing trends in how obesity has maybe grown as an issue in this country at a potentially alarming rate. Very interesting analysis. Another factor that may be worth considering is the typical diets of the inhabitants of various states. Outside of what is available at fast food restaurants, different foods are typically consumed by different regions. For example, many popular southern dishes are extremely calorie dense and often contain large amounts of fried foods. I would think that this has some correlation to the fact that southeastern states have the highest rates of obesity. This is a very interesting and important research topic to look at. You talk a bit about the various diseases associated with high obesity in a population and eliminating high obesity would hopefully limit the prevalence of these diseases. I would be very interested in comparing the US and other countries around the world to understand whether the same factors are in place. Is there some sort of an equivalent to the southeastern US states in France somewhere? Are the same types of factors at play? This would be a much more involved project but I believe a similar analysis to what you’ve already done could be used. Nice work on this article. This is exactly what I thought of! I’d like to see how her campaign periods have impacted obesity levels in specific areas after the campaigns have ended. It would be interesting to even take it a step further and look at specific school districts. Interesting analysis. I wonder if building more fitness centers would decrease obesity levels. I think the relationship potentially runs in the other direction: that populations that are more health conscious and affluent, such as those in Connecticut, are more likely to seek fitness centers. I bet big national chains like Anytime Fitness are pretty conscious of demand, especially since they’ve likely already saturated markets such as Connecticut. My guess would be that if they aren’t building more fitness centers in Mississippi, it’s because they don’t predict that the demand is there. This is an extremely interesting analysis of n issue affecting millions of people. I thought the income analysis and food security analysis was particularly interesting, showing a trend that I would expect. I was shocked that the African-American obesity rate is 1.5 times the White obesity rate. As you state the correlation between the state’s obesity rate and African-American population, I wonder how much the income level correlation with obesity has to do with the African-American obesity rate being 1.5 times greater. I know the African-American poverty rate is much higher than the White poverty rate. Great post! Very interesting topic! 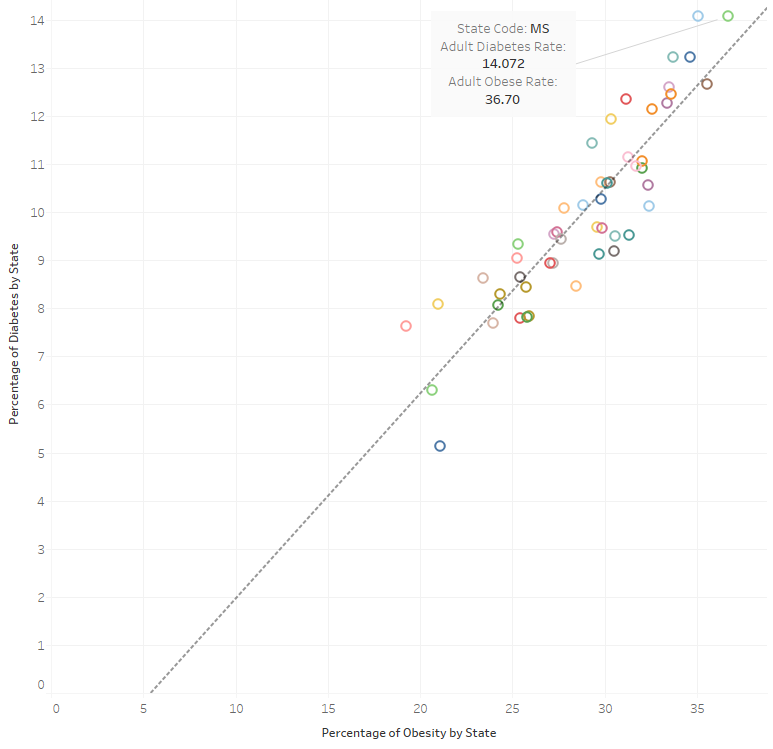 I particularly liked how you gave a visualization to which states had the highest obesity rate. It was eye opening to see that the country was almost divided in half by having a high obesity percentage versus a low one. It makes you wonder maybe what effect the environment you live in had on your weight or eating habits. Very interesting! Small states as Rhode Island or Massachusetts seems to have better results than bigger states, it could be interesting to perform a geographical analysis with cities or smaller regions in order to know if theres is a big difference between big cities and the country side. it would be also interesting to analize university areas where people is usually practising more sport versus rural areas. Definitely a topic of concern. I think it is very discouraging that healthy foods tend to cost more. The premise makes senses but is a concerning fact. We often talk about price differences of healthy vs non healthy food and if you are more poor, you tend to eat worse due to this. To be able to actually quantify this fact and see the data in front of you is really interesting. I have never heard of the term “food insecurity” but after reading this but it obviously makes a lot of sense with the analysis. 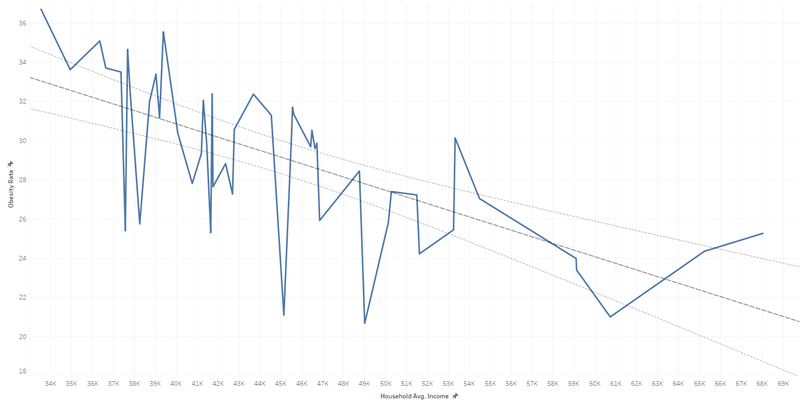 Even though the r^2 value is low, there is a clear trend. This is a very interesting analysis. It would be very interesting to analyze the role that culture and reception plays on specifically the analysis of healthy food and number of recreational facilities. For example, is there any reverse causation taking place with the recreational facilities. Perhaps the reason there are more recreational facilities in Massachusetts is because they value the culture values activity more and that’s why more were built. It would be interesting to see which factor came first. A similar analysis could be done with the number of fast food restaurants and lack of healthy food. Thank you for sharing your analysis. I thought that it made sense that the more fitness centers, the lower the obesity rate in the state. I did find it interesting however that the highest obesity rates did not necessarily have the lowest number of fitness centers though. I would be interesting in seeing how obesity changes over the next few years based on new healthy school lunches being implemented, more education to the public about health eating, and implementation of transportation sharing. As someone really interesting in healthcare I know that obesity related deaths is the number one cause of death in the United States. It’s truly a public health crisis, and I really like the way you quantified and visualized the issue. I hadn’t thought of obesity being a monetary issue, but there is a clear correlation between higher rates of obesity and worse off areas. Not only can people not afford good food, but they can’t afford gyms, workout equipment, etc. Great topic to cover in the United States, where obesity is more of a problem than anywhere else in the world. I thought the authors did a good job of preprocessing the data and validating its significance showing that obesity leads to life-threatening conditions. 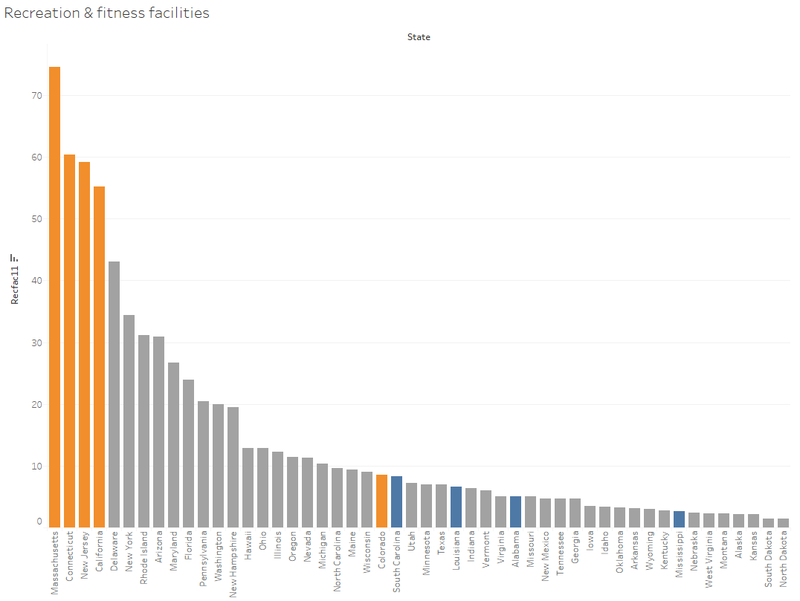 I found it interesting that the 4 states with the lowest obesity rates also had the highest prevalence of fitness centers, a statistic I don’t think I have ever seen before (and made much clearer by Tableau!). I also liked the way that the article was structured and ended by offering suggestions on how we could possibly improve national obesity rates. Thank you for sharing your work. It was informative to see the relationship between obesity and income level. It shows that obesity is caused by many underlying factors including income. On the last graphic it was interesting to see some states had a ton of workout facilities, but it may have been slightly misleading since it was not adjusted per capita. Thank you for sharing your work. It is kind of quite interesting to see the negative correlation between income and obesity as conventional wisdom would lead us to think otherwise. 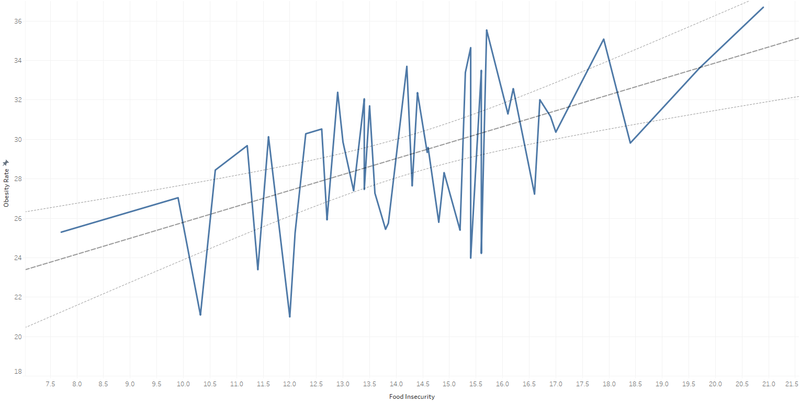 Also the I appreciate the graphics use as it shows the linear trend and the variation of the data. I think that considering “age-group” into your analysis would be very interesting. This would complement income level very well. As families have less money to spend food on, they usually resort to fast-food, which in turn affects the kids the most because they will grow up eating fast-food and will be at much higher risk of diabetes. Another note to add is that kids who grow up mainly eating fast-food may continue this trend into their future, regardless of income. I wonder if those fast food fanatics will keep eating unhealthy even if they have money to spend money on more healthy options, which is more expensive and less efficient (cooking time). Obesity and diabetes have been a hot topic in US health new for quite some time now and this post is no exception. While states in the Southeastern US suffer the most from these health issues, the states that have the lowest rates of obesity and diabetes have some of the highest rates of recreational centers and food security. While increasing rec centers and food security in the southeastern United States may help, I think if would be interesting to see where people suffering from obesity and diabetes are living (City, Suburbs, rural, etc).